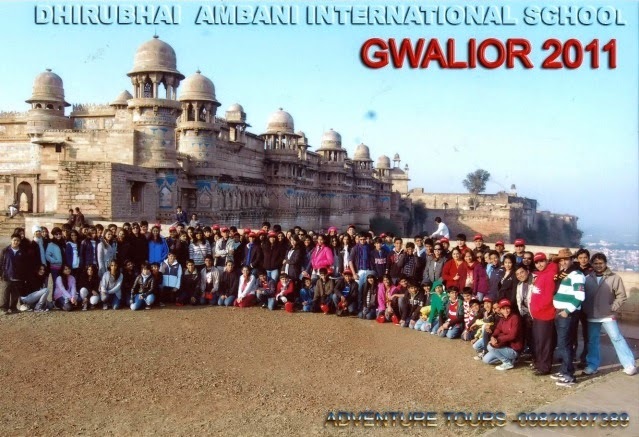 This year, class 8A, B and C students, accompanied by 10 teachers, visited the cities of Gwalior and Jhansi in the northern part of India; as part of their annual educational school trip. The trip was scheduled from the 8th to the 12th of January. We assembled in the school on 8th January at 7 p.m, and were informed that our train had been delayed due to severe fog. We were then given a presentation on the historical importance of Gwalior and Jhansi in our country. We were shown an excellent array of Gwalior's colourful history, going back to the 8th century; a mosaic of the Rajput clans, each leaving their mark on the city's magnificent monuments. Also, the story of Rani Lakshmibai and the revolt of 1857 whetted our appetite to be on our way soon. At long last, we left school in three buses and we boarded the Punjab Mail from CST station. The AC compartment was comfortable and after our seats were allocated, we went off to sleep. The 21 hour train ride was the longest and even though we were properly fed and taken care of, every one of us wanted to reach Gwalior as soon as possible. Some of us wanted the permission of the teachers to call our Railway Minister, Mamta Banerjee, which everyone found funny. We reached Gwalior at midnight on the 9th of January and for most of us it was the first time we experienced the cold weather of north India. It was now clear why the school constantly reminded us to carry sweaters, sweatshirts and jackets and as we boarded the bus for the hotel, we saw the poor on the streets that did not have the luxury of warm clothing which we did. The hotel was nice and comfortable and as soon as we reached, we had hot food and were directly packed off to sleep in our respective rooms. We woke up next morning and after a hearty breakfast, we began our trip of Gwalior. Our first stop was the Jai Vilas palace, remnant of the last rulers of Gwalior. This palace is patterned on European style and was completed in 1872. The main attraction in this gigantic palace is the Jivaji Rao Scindia Museum. The most amazing part was the crystal staircase which winds its way up to the spectacular Durbar Hall. The arched ceiling, with stunning gold leaf work, carries two of the world’s largest and most magnificent chandeliers, each weighing over three tons and holding 248 candles. The guide told us that the roof was tested in advance by getting 10 elephants to climb upon it via a two-kilometre ramp. We all left the palace, in awe of the architecture of this magnificient palace. Our next stop was the Memorial of Rani Lakshmibai, and here we learnt that inspite of being born a woman in the year 1835, she was an able fighter and an expert horse rider. Her rule of Jhansi and her eventual war with the British in 1857 did not fail to inspire us, but the fact that she accomplished all this and a place in Indian history within a lifetime that lasted a mere 23 years made us realize the greatness we all are capable of. I think everyone who looked at that memorial was proud to be an Indian. After lunch in the hotel, we left for the most spectacular part of the journey, the Gwalior Fort.This is situated on a hill, above the town of Gwalior and is made of sandstone. The fort has come under the rule of many dynasties after Tomars built it. Tomars were succeeded by Mughals, Marathas and British. The plains around the fort were the center of turbulence during the first war of independence in 1857. It was here legendary soldiers like Tantia Tope and Rani Lakshmi Bai were defeated by the British. We also visited two temples inside the fort, Saas – Bahu temple and Teli ka Mandir, both 9th century temples dedicated to Lord Vishnu. 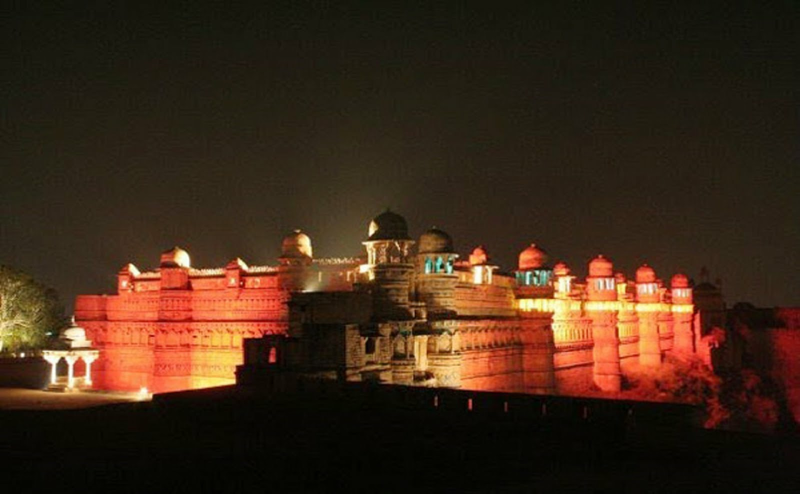 But the most impressive highlight was the sound and light show which told us the entire story of Gwalior and the fort. We were so spellbound that some of us forgot the biting cold on the top of the hill. We finally returned to the hotel at night, feeling a lot more learned about our history than we could ever learn at school. The next morning, we bid farewell to Gwalior after breakfast, and went to Jhansi by bus. It took us 4 hours to reach Jhansi and after lunch, we went to Jhansi fort. We were impressed by the enormity of the fort and the size of the cannons at the entrance to the fort. We had heard so much about the Rani of Jhansi that to see her fort was a treat. In the fort, one of the most important locations is the place from where she jumped out of the fort on to a horse. She tied her adopted son on her back and jumped from top of the fort on her horse Pavan. The height of the fort walls on the hillock clearly highlights the courage she had. The view of the city of Jhansi from the fort was truly breathtaking. This wrapped up our year 8 trip to Gwalior and Jhansi. We had dinner and then boarded the train back to Mumbai. Although most of us were glad to be getting away from the cold, I think we all carry a part of these two cities with us. We were very glad to have been brought here because we have studied and heard about these cities a lot, and to be able to visit these places in person and hear all the local stories, just made us feel that much more connected to all that we learn in class. We are all looking forward to another learning experience next year.